Balustrades can be made from several different materials such as Stainless Steel, aluminium, Mild steel, stainless steel wire rope, or frameless glass. If needed, we can use a combination of different materials to create the exact look that you are after. Be assured which ever you choose, you will receive the best quality materials available as we only use trusted suppliers. Our balustrade systems can be custom made to suit your exact requirements or choose one of our designs and we can make it to suit your measurements . 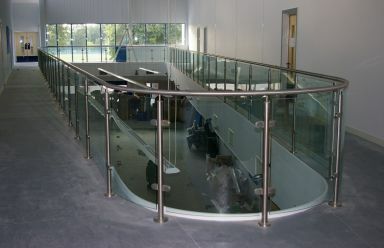 Stainless Steel Project Pty Ltd can make your custom balustrade. We will meet with you and gain an understanding of the look that you are after. If you need inspiration, we are happy to show you examples of our previous work. Once we complete a measure and quote we can decide on a time frame and get started as soon as possible. If you are looking for an attractive fence and gate system, why not install a balustrade? Balustrade systems can be used as a very effective fence system around your property’s boundaries or even for pool fencing. If you use it as pool fencing, it is imperative that they are installed to meet all safety requirements, which our staff are trained to comply with.